I am thrilled to announce that my new homepage www.kharanine.com is up and running! It’s still under construction while my dear Webhamster is giving it the final touches, which he tells me will take just about forever (I think he means to tell me that a website is never ever really done), but now at least I have a proper official home address on the web 🙂 Meanwhile, this blog isn’t being abandoned; it will go on living as the blog part of my new website, and it is of course properly linked from there, too. Why would anybody who was raised in a loving home be unhappy about being adopted? Why indeed would anyone who was raised in a loving home be unhappy about being adopted? Why would anybody who was raised in a loving home be unhappy about being adopted, or opposed to the very nature of adoption? This was asked to me today in the comments on the “About Me” page I have here. Its a genuine question that I think a lot of people who aren’t effected or maybe even are effected by adoption ask themselves once they come across someone who’s views towards adoption, are similar to mine. I do not support it. I don’t condone it, nor do I believe in adoption. I have many reasons and I think it will do me some good after this long break to put it into a post and get it into the concrete form of some kind for others to read when wondering why the hell i feel the way I do. Read the original article by Nev Moore for Massachusetts News, May 5, 2000 here. An enlightening, eye-opening article describing the money game of adoption in the United States, how it’s possible to boost your income considerably by adopting any number of children, rewarding you social benefits above and beyond anything the original parents could have even dreamed of! It boggles the mind, but it makes me wonder, how about if parents adopted their own natural children, in order to get enough benefits to make by and raise their children themselves? No, I’m pretty sure they’ve ironed out that specific loophole. Spending money on actually helping people help themselves is utterly out of the question. We can’t have that! It’s important to note, though, that this article is from May 2000, 14 years and several presidential terms ago. I have looked, but not found, so if anyone can provide pointers to information stating that these practices no longer exist, I would appreciate if you would leave a comment with updates to that effect. This Danish documentary from 2012 is heartbreaking, and it clearly demonstrates so many of the things that are wrong about adoption. Childless, at age 44 and 46, after seven years of being unable to have children of their own, the Danish couple Gert and Henriette decide to adopt the siblings Roba and Masho, aged two and four, from Ethiopia. The children’s natural parents Sinknesh and Hussen are still alive, but suffering from AIDS, and the mother Sinknesh has been told by her doctor that she will die “in exactly five years”, three years prior to the adoption. For this reason, and this reason alone, the couple decide, or rather allow themselves to be persuaded by the agency DanAdopt, to put their two youngest children up for adoption. Promises are made that they will receive periodic reports on their children’s progress and well-being. Three years after the adoption, and six years after being told she had only five more years to live, Sinknesh and Hussen have received no information about Roba and Masho. They are both still alive and well enough that they’re capable of working and taking care of their three remaining children, and they still mourn the loss of their two youngest, of whom they have had no word since they were taken away. They try to confront DanAdopt and the Ethiopian authorities, but to no avail as they are stonewalled and rejected. In Denmark, things are not going so well either. The adoptive parents are disappointed that Masho does not bond with them as they had expected. Mother Henriette punishes Masho for her “bad” behaviour by withholding affection, although it is precisely affection that she needs. They appear to make little or no effort to understand the needs of the children, but rather expect them to adapt to their new, alien surroundings without trouble, and then blame the children when this does not happen. Hardly ever after they return to Denmark do you see the adoptive parents smile, especially the mother who most of the time looks completely stone-faced. I consider being past 40 as very late in life to have children, and especially to adopt children who have special needs because they are removed from their natural environment, old enough to already have a language and strong ties to their natural family, accustomed to their original local way of life, being ripped away from everything they know, including the love of their natural parents, and thrust into the custody of strangers who do not even speak a language they can understand. Of course they are afraid, in turn fear leads to anger, and anger leads to suffering. Being the oldest of the two, with deeper roots to her home, Masho struggles and suffers the most. Henriette and Gert show clear signs of having no idea what they’ve let themselves in on. In their eyes, they’ve bought a product that doesn’t live up to their expectations, and which doesn’t come with any warranty. In short, they feel cheated! At their age, it would be enough of a challenge to have their own biological child, although this would have been a whole lot easier to handle. Their own child would have been born into the family, and their bonding would happen naturally. However, having no previous experience whatsoever with raising children of their own, yet diving headlong into adopting not just one but two children as old as Masho and Roba, from a completely different culture, with no mutual language to communicate, no knowledge of their original home and customs, was a recipe for disaster because Gert and Henriette did not have even the most basic skills or knowledge to handle the situation. It’s clear from the adoptive parents’ attitude that they had solid prior expectations as to how well this would go, as if according to a plan. When it doesn’t, they act disappointed as if it was Masho who had asked them to adopt her, and not lived up to her part of the deal. Masho, on the other hand, looks like a caged animal, marked by the futility of her situation, struggling with grief and missing her mother, the single most important person in her life, and the fact that she will probably never see her again. “Do not worry about the children. They will forget you. The organization Against Child Trafficking (ACT) are following Masho’s case, and working to have her reunited with her natural parents. You can follow their Facebook page Operation Masho—Reunite Masho with her Ethiopian family. You can also help support ACT by donating through their webpage. Those of you who have followed my blog may have noticed that there hasn’t been any activity for some time. The main reason for this is simply that I’ve been consumed by the project of turning my blog into a book. Though some of the chapters have been taken more or less verbatim from this blog, most of it is brand new. It’s been a long and laborous journey, but now at last I am finally there! The book was completed not long ago, and I finally feel ready to go public with it. I could not have made it without the help and support from my husband and our daughters, my husband’s family, and definitely not least the guidance and encouragement from my dear friend and mentor Joe Soll (who also wrote the introduction). Big thanks to my friends all over the world, on Facebook and elsewhere, who have cheered me on while I was writing, and read my book after it was finished, and provided the positive feedback which has given me the confidence to also announce it here on my blog. I am thrilled to see that in the few brief months that the book has been out, I have received four five-star reader reviews, and it also warms my heart that a number of authors have asked to include parts of both my book and my blog in books and other projects of their own. If with this book I succeed in helping even just one adoptee, it will be totally worth the effort I put into it. It’s available in paperback on www.amazon.com, and a Kindle version is in the works (to be announced here on the blog when it’s ready). In 1970, shortly after the death of her mother, and without the consent or even the knowledge of her father, a barely one year old girl is put up for foreign adoption in South Korea. She ends up in an adoptive family where she spends her childhood suffering neglect and abuse at the hands of her adoptive parents. “Cries of the Soul” tells a story rather different from the more common, picture-perfect fairy tales of the adoption industry. With her original childhood and natural family stolen from her, Khara Niné describes the harsh reality of coping and trying to fit into a family where she doesn’t belong, of grieving the loss of parents she can not even remember, and the emotional scars which she is still struggling to get to grips with more than forty years later. “Cries of the Soul” is the most complete and compelling book I have ever read about the horrors of the separation of a child from her origins. Anna Freud’s statement that the horrors of war pale beside the loss of a mother is brought to reality by the gut wrenching writing of Jung Kyung Sook. Beginning with the trauma of lying in the arms of her beloved Umma when she died, Kyung Sook takes the reader through her life’s journey with a colorful, flowing narrative, joyous in parts, yet mostly a soul wrenching description of one woman’s struggle to survive. Those who face their demons are some of the strongest people on the face of the earth. Kyung Sook is one such person. Her story had to be told and she told it well. This book is a Must Read!” – Joe Soll, psychotherapist and author of Adoption Healing… a path to recovery. This story was a tribute to Kyung Sook’s strength to live and prosper. I admire her determination to see beauty in the world around her, and her perseverance to keep going like when Kyung Sook describes the Christmas that she decorated the tree when no other family member would. The determination to choose to live when it may have been easier to take her own life. The way that Kyung Sook went on to create a family of her own in which her daughters grew up safe and happy. It is stories like hers that give parents like the me the education that we need to be better parents for our children whom we have adopted. We do listen. I know that there are not many of us, but we are out here and we do listen and learn. My own kids are growing into fine young adults. They have benefited from going to Culture Camps, cooking Korean food, and travelling to Korea (more than once) because we listened. Thank you for sharing your story. This book is a wonderful read. The author covers so much about what an adoptee from korea may feel. Her story of her family left to search for her is heartbreaking and her descriptions of fitting into a totally new culture where she is labeled an outsider is very sad. She also manages to cover some of the corrupt side of international adoptions and is very courageous to tell her truth. She covers the spiritual side and the emotional side very well. It is a great read and an eye opener about how the adoption industry effects those in it’s grasp. Cries of the Soul is an autobiography of the life of a Korean adoptee who grew up in Norway that is told in beautiful and haunting vignettes that are seamlessly woven together. 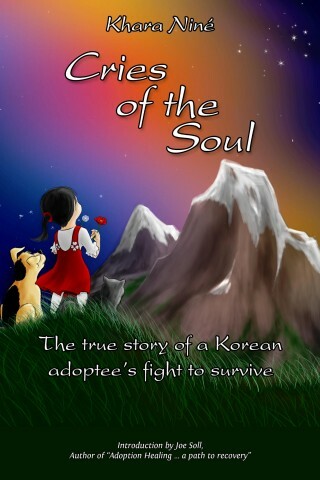 Although the book may be of particular interest to adoptees, it is such a compelling book and written in such a lovely way that I recommend it for any reader (though not young children; although Khara Nine, nee Jung Kyung Sook, writes with the innocent voice of a child, it is a book for those mature enough to understand the painful and dark side of adoption). What I loved most about this book is the author’s voice. It is the voice of a girl who appreciates the innocence of climbing trees and her beloved stuffed animal. Her detail is spot on — I have never been to Norway but felt I was there alongside her with the beaches and fjords. Her descriptions of happy occasions are punctuated with the abuse she suffered at the hands of her adoptive parents, and these moments when the reader is suddenly swept from an idyllic situation to the reality of her abuse are jarring and suspenseful. Her writing is reminiscent of fairy tales, but real and without the happy ending. Interwoven with the stories of her childhood are her adult musings on finding her sisters, learning of her father’s death, and her own family in Norway. The book has all the lessons of a great psychology or self-help book but is told as an incredible life story. I highly recommend this thoughtful and thought-provoking work.